Convertible: May be used on shallow or deep well applications using appropriate Goulds Water Technology Pumps fittings. pump for service without disturbing piping. Corrosion resistant, engineered plastic tubing and fittings are easily removed for cleaning. Premium O-ring design, fittings need only be hand tight to seal. Diffuser (Guidevane): F.D.A. compliant, injection molded, food grade, glass filled Lexan® for durability and abrasion resistance. Powered for Continuous Operation: Pump ratings are within the motor manufacturer’s recommended working limits. Can be operated continuously without damage. 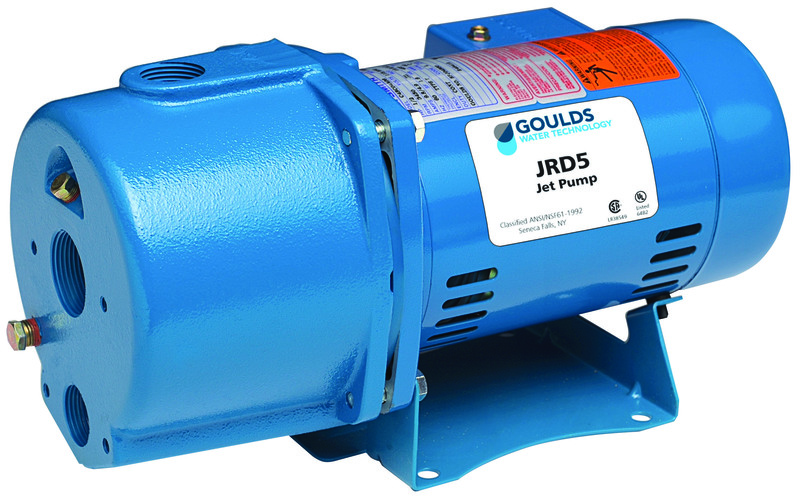 Excellent Air Handling Ability: After initial priming the pump has the ability to re-prime itself even when air enters the system. Pumping resumes once the water level rises above the foot valve. Basic Pump Unit: Includes pump and motor, pressure switch with tubing and fittings. Water system tank required on all systems.